Warmer temperatures are spreading throughout the country, which can only mean one thing. Summer is just around the corner! You may be eager to hit the road with your horse this summer. Maybe you are headed on a camping trip with your horse, or maybe a training clinic, or even a competition. Before you travel, here are a few tips you should keep in mind. Make sure vaccines are up to date – Core vaccines for horses include Tetanus, Rabies, Eastern Equine Encephalitis, Western Equine Encephalitis, and West Nile Virus. Equine Influenza and Equine Herpesvirus Type 1 and 4 (sometimes called “Rhino”) are commonly recommended risk-based vaccines, especially if your horse will be congregating with others. Your veterinarian is best equipped to make specific vaccine recommendations for your horse and your travel plans. Consulting with your veterinarian several weeks prior to travel is best, as vaccines take time to provide protection. Have paperwork in order–It is important to have a current, valid health certificate, proof of negative Coggins (test for Equine Infectious Anemia), and documentation of ownership readily available for inspection. If you are crossing state lines with your horse, officials may require you to present these documents prior to entering the state. Similarly, officials at show grounds or campgrounds may also want to inspect the documents. Your veterinarian can provide you with a health certificate and proof of a negative Coggins. Additionally, she can microchip your horse, providing a permanent form of identification. 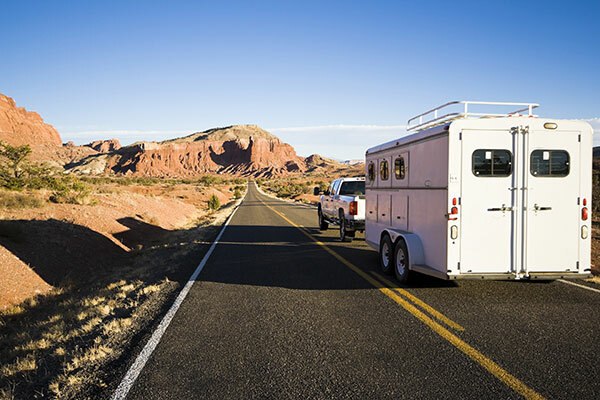 Condition your horse to trailering prior to travel – Nothing is worse than being set to go for a big trip and then having a horse that won’t load at the critical moment. Many horses are afraid of trailers and are therefore difficult to load. Practicing ahead of time and using a training aid such as Zylkene can help horses learn to load easily. Zylkene contains a milk-based protein that helps horses cope with stressful situations, allowing them to focus on loading instead of worrying about what might be lurking inside the trailer. Ensure proper hydration, nutrition, ventilation and housing conditions for your horse – Adequate supplies of food and water should always be provided for your horse when you travel. The summer heat, exacerbated by the confined space of trailering, can cause horses to lose extensive amounts of fluid. Make sure you provide adequate supplies of clean water. Some horses may be reluctant to drink when water from a different source has a different taste. Consult your veterinarian for tips on ensuring proper hydration for your horse, even when they don’t seem to want to drink. Similarly, have plans in place for feeding your horse. If you plan on buying feed when you arrive, make sure you bring some of your own with you so that you can gradually transition their diet, decreasing the likelihood that the change will cause your horse to colic. Ensuring that your trailer and stabling conditions have appropriate ventilation will help keep your horses cool during your trip. Additionally, good ventilation can reduce the presence of dust, allergens, and respiratory pathogens. Knowing what the housing conditions will be before you arrive can allow you to plan ahead and pack accordingly. Have a first aid kit available – Many items can be included in an equine first aid kit. Some essential items include: non-adherent dressings, gauze squares and bandages, roll cotton bandages, leg quilts and wraps, flexible self-adherent wrap tape, medical tape, bandage scissors, antiseptic scrub, antiseptic wound spray or gel (such as Derma Gel), sterile eye wash, digital thermometer, gloves and duct tape. The phone number for your veterinarian and one at your destination should also be included. Consult your veterinarian for other specific recommendations for your horse and situation. Don’t forget to pack a first aid kit for yourself as well! Check pet rules before you travel – Horse owners often love to travel with their canine companions. Some venues may welcome dogs, some may require health documents or have leash rules, others may not allow pets at all. Before heading out this summer, make sure you know the rules regarding pets at your destination so you can plan accordingly. As you are organizing your trip, plan to leave early in the day to avoid the most intense heat. Stopping for breaks every 4-6 hours is important. You can offer your horse water and give them a rest from the road motion. Enjoy the summer and have healthy and safe travels! Wound dressing for horses maintains a moist wound environment. A patented essential branched chain formula for horses. A phenylbutazone paste for horses.